Ah, the project review. Like death and taxes, if you work in a larger company, these are probably an inevitable fact of life – at some point, and maybe quite frequently, you have to get in front of somebody senior and give a review of the state of your project. At Microsoft, the ritual of the “BillG Review” was woven into the culture when Bill ran the company. Your review might be anything from a routine monthly status update to a high stakes undertaking with people who have the ability to cancel the project (and/or fire you). Designing a great review is complex and involved; you want to tell a compelling story that resonates with your audience, to distill the work into its essence, and to convince that the team is executing well and should continue to get support. These reviews can take on a life of their own and soak up tremendous amounts of time that could be (much) better employed in getting the darn work done, rather than talking about it. This is one of the reasons that small organizations can be more efficient – they don’t need to prepare reviews of the work they are doing, because everyone is too busy getting it done. To avoid getting bogged down in an expensive manage-up exercise, when I’m preparing for a review I try to stay focused on what I call the “pet rock” principle. 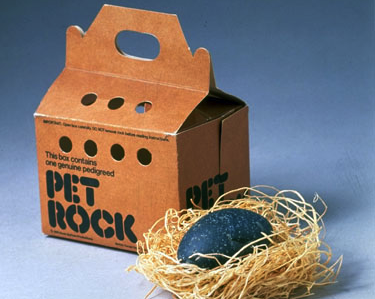 If you didn’t grow up in America in the 1970’s, you might not have heard about the pet rock – it was a hilarious (and self-mocking) fad where people bought a rock, instead of a real pet, because they are much less trouble to take care of. Pet rocks were very good at some tricks – as the instruction manual explained, they excel at “sit” and “stay”, but struggle with “shake hands”. Since the pet rock is an iconically useless object, it seems like the perfect stand-in for some members of senior management, as seen from the trenches. The principle that’s guided me through many reviews (on both sides of the table) is that most of the value from a really good review would be achieved if you replaced the audience with a pet rock. In other words, the review should be mostly designed to benefit the team, not the reviewers. Articulate the goals, strategy, and execution plan for the project. As I have repeatedly advocated throughout this blog, there is magic to writing things down. It forces you to think much more carefully and systematically than you usually do. A review is a great opportunity to tell your story to your own team. Usually the leaders of a team assume that everybody “gets it” .. and often that isn’t true. It’s incredibly valuable for the team to walk through the vision, the strategy, and the plan. From research in advertising, we know that people do not absorb a message until the third exposure (and some studies have yielded much larger numbers). Distill the essence of the work. Senior people generally get bored easily, so they won’t let you maunder on at endless length about what you are doing. They want it summarized into a succinct and effective form. Figuring out how to capture the work you are doing in a tight and lean format is a powerful exercise. And it’s hard. Often you won’t bother to do that work until you have a forcing function, and the review can be that forcing function. Enumerate top issues/risks and what is being done about them. It’s easy for teams to get desensitized to their biggest problems. “Well, yes, there is a blazing fire over there that threatens our success, but it’s been on fire for a while and we just don’t have time right now to worry about it.” Reviews can force you to think those problems through and make sure you have a plan to resolve or mitigate them. An excellent review can be a morale booster that reminds everyone of the exciting mission that they are on. It can identify issues that are falling through the cracks, and can help you to hone your execution. Mostly, that isn’t how it works, though – they provide modest benefits (at best) for the team, and they represent a bunch of overhead that saps precious reserves of energy and enthusiasm. So if you are pulling a review together, see if this principle helps you stay focused. Constantly ask yourself whether you are working on something you would truly continue to do if there were a pet rock presiding over the review. When the answer is no, you are just managing up. You may have to do some of that, but the more you do, the less you are advancing the organization’s true interests, and the more you are creating the overhead that everyone complains about. Omit needless work .. and remember the rock!